Who Are The Hardest Businesses For Shoppers To Work With? According to a recent survey analysis, Sam’s Club, Publix, and Subway are some of the easiest businesses for consumers to work with. On the other end of the spectrum, some of the hardest businesses and organizations for consumers to work with are Medicaid, Charter Communications and Empire (Blue Cross/Blue Shield). Companies that were received an 80% or better accessibility rating, and therefor were considered in the ‘excellent’ category, included (in order of ranking) Sam’s Club, Publix, Subway, Lowe’s, Aldi, H.E.B., Chick-fil-A, Kroger, Sonic, Starbucks, Winn-Dixie, Whole Foods, USAA, and ShopRite. 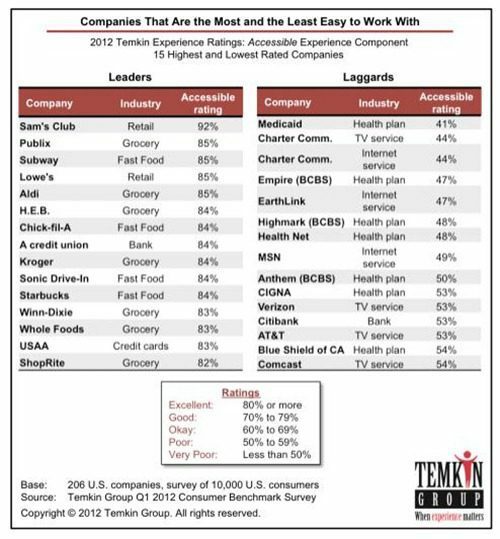 Companies that ranked the least accessible include Medicaid, Charter Communications, Empire (BCBS), EarthLink, Highmark (BCBS), Health Net, MSN, Anthem (BCBS), CIGNA, Verizon (tv), Citibank, AT&T, Blue Shield of CA, and Comcast. Four of the least accessible were health care plans/insurance.